Car enthusiasts and wishful thinkers, join the festivities at the L.A Auto Show. The Los Angeles Auto Show continues to grow in importance as an international auto show with more significant World debuts than ever before. As the first major North American auto show of the season, the L.A. show provides a preview of the latest vehicles that may define the future of the automobile. The debuts feature almost every automobile segment. Hybrids will have a stronger presence than ever with several significant debuts breaking cover. Attractions include The all-new AutoTrader.com MATCH IT Live Game Show, Volvo’s City Safety Test Drive system, State Farm’s Workshop for Women: Purchasing and Protecting Your Vehicle, and a Lakers Appearance, Saturday, Nov. 29 3:00-4:00 pm Toyota Exhibit in West Hall; Two Lakers players are bringing 500 headshots to sign; first come, first served basis. I'm there for the freebies, plus kids are free! 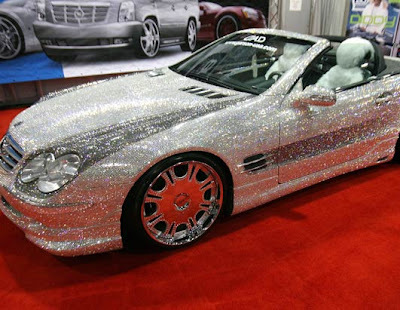 Is that car made of DIAMONDS??? I need that as my 3rd car! Hi there it's me, I am also visiting this website on a regular basis, this website is actually nice and the users are really sharing nice thoughts. I'm having some small security issues with my latest blog and I would like to find something more risk-free. Do you have any recommendations?